IJSR aims to promote the international exchange of knowledge, ideas and information about the very best research undertaken about Sudan without promoting any kind of political views and/or ideologies among the different stakeholders in and outside Sudan. Therefore, IJSR will have a significant role to play in bridging the knowledge divide between Sudan and the rest of the world and help in the rapid generation and diffusion of knowledge within Sudan. Finally, IJSR aims to consider new perspectives in the field of science, technology and innovation policy in Sudan. The journal publishes original papers, review papers, conceptual papers, technical reports, case studies, conference reports, management reports, book reviews, notes, commentaries, and news. IJSR particularly encourages papers that significantly bring new knowledge to the area both for academics and practitioners. Special Issues devoted to important topics about Sudan will occasionally be published. 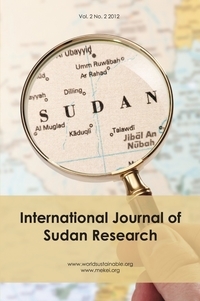 IJSR is intended to benefit ordinary people, students, academics, professionals, researchers, policymakers, businesses, etc from both Sudan and the rest of the world with the best available scientific evidence, to enable better understanding of the different opportunities and challenges facing Sudan.